The witness type recommended for Workgroup clusters and Multi-domain clusters is a Cloud Witness or Disk Witness. File Share Witness (FSW) is not supported with a Workgroup or Multi-domain cluster. 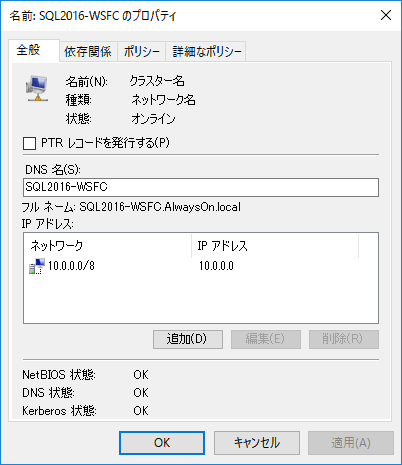 C:\Scripts\PsExec.exe -accepteula -s cmd.exe "/c PowerShell.exe C:\Scripts\CredMan.ps1 -AddCred -Target 10.140.0.11 -User '<接続ユーザー>' -Pass '<パスワード>' -CredType DOMAIN_PASSWORD -CredPersist ENTERPRISE"
C:\Scripts\PsExec.exe -accepteula -s cmd.exe "/c PowerShell.exe C:\Scripts\CredMan.ps1 -ShoCred  -CredType DOMAIN_PASSWORD -CredPersist ENTERPRISE"
C:\Scripts\PsExec.exe -accepteula -s cmd.exe "/c PowerShell.exe C:\Scripts\CredMan.ps1 -DelCred -Target 10.140.0.11 -CredType DOMAIN_PASSWORD -CredPersist ENTERPRISE"